The Edmonton Oilers’ 2016-17 season officially gets underway on October 12th, and when it does, there will be a seemingly endless number of storylines to follow as the campaign progresses. In the off-season of 2016, General Manager Peter Chiarelli went to work improving his roster. It all began at the 2016 NHL Entry Draft, where the Oilers, who were slated to select Mikhail Sergachev fourth overall, looked on as the Columbus Blue Jackets passed on Jesse Puljujarvi. For the Oilers, yet another bit of Draft luck allowed them to select the promising powerful forward, a selection which essentially sealed the fate of Taylor Hall. Following the Draft, it was, in fact, the Hall trade which represented the next major shakeup within the Oilers roster. Although dealing the superstar winger and former first overall pick was painful for both Edmonton’s fan base and the club itself, the move signified the fact that the current crop of players simply could not be relied upon to return this team to the postseason. Given these two additions, optimism was already at a high in Edmonton ahead of the approaching season. Yet, come July 1st, the Oilers added yet another major piece to their roster, signing Milan Lucic to a seven-year, $42 million contract. Although many balked at both the length and financial term of the contract, Lucic’s presence will immediately alter the perception of the Oilers on the ice. In addition to the introduction of these players, there will also be a number of internal storylines which are bound to play out as the season progresses. Whether it be the role of Ryan Nugent-Hopkins or the potential breakout play of defenseman Brandon Davidson, the 2016-17 Oilers season will feature more than its fair share of players to watch. When the Oilers officially announced the signing of Lucic on July 1, 2016, the news arrived alongside a major shift in perception of Edmonton as a team. Long viewed as a highly skilled yet young and somewhat fragile squad, the addition of Lucic, long one of the NHL’s most intimidating players, immediately provided a sense of incoming strength and physicality to the Oilers’ roster. 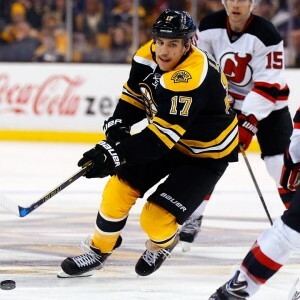 However, what makes Lucic so valuable, and worth his $6 million annual salary, is the fact that he can successfully play a physically dominant game while providing offense at a consistent pace. Throughout his career to date, Lucic has averaged roughly 50 points per season, or 0.61 points per game. While these offensive totals are not typical for a first line player, it is his offensive flair in combination with his physicality which will likely see him play alongside Connor McDavid in 2016-17, a situation which could very likely inflate his offensive output to a career high level while readily protecting Edmonton’s young star. In the coming season, there will be a number of aspects to watch when it comes to Lucic’s game. Firstly, and likely most importantly, will be that of his offensive production, as he will essentially be replacing Hall on Edmonton’s top line. As a former 30-goal scorer, production in the range of 25-30 tallies should be expected, especially so playing alongside McDavid. If the hulking winger can combine for 60 points, I would say he is well worth the investment. However, on the other hand, it will be interesting to see whether or not Lucic can play a responsible physical game. While he will be counted upon to play a physical role, it must be one that is calculated and purposeful. If Lucic begins to fall in the habit of taking unnecessary penalties, he could become a liability to the team on a nightly basis. Perhaps the most interesting player to watch this coming season will be none other than Ryan Nugent-Hopkins, the Oilers’ first-round, first overall pick in the 2011 NHL Draft. After enjoying a strong rookie season, in which he recorded 52 points in just 62 games played, Nugent-Hopkins has failed to truly breakout at the NHL level. In fact, since his rookie season in 2011-12, the ‘Nuge’ has managed to increase his career-high point total by just four points, scoring 56 points in both the 2013-14 and 2014-15 seasons. However, once projected to be the Oilers’ first-line center, Nugent-Hopkins’ inability to produce offensively at an elite level has led to his name being included in a seemingly endless number of trade rumors. When the Oilers drafted Leon Draisaitl third overall in the 2014 NHL Draft, followed by McDavid first overall in 2015, it immediately put Nugent-Hopkins in a tense situation. Playing as Edmonton’s top center-ice man for years, Nugent-Hopkins suddenly found, and currently finds, himself situated as the Oilers’ unofficial third line center, a role hardly befitting of a former first overall selection. As such, in the 2016-17 season, it goes without saying that Nugent-Hopkins will need to make the most of each and every opportunity he is provided. If he plays well enough, perhaps Nugent-Hopkins can force the Oilers to shift Draisaitl to the wing, yet doing so will likely require a career-best campaign for the ‘Nuge’. If his play fails to improve and he is unable to move up Edmonton’s depth chart, chances are Nugent-Hopkins will once again be on the trading block. Yet, if he is able to play at an elite level, Nugent-Hopkins could certainly remain a highly valuable piece of the Oilers’ future. Well, one would think that four first overall draft selections in just six years time would be more than enough good luck for one team. 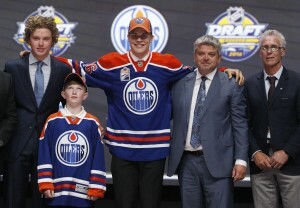 Yet, the Oilers, who despite being provided four first overall picks in recent history, were afforded another bit of Draft luck when Puljujarvi, long projected to be a top-three pick in the 2016 NHL Draft, fell to Edmonton at fourth overall. Why the Columbus Blue Jackets passed on Puljujarvi in favor of Pierre-Luc Dubois is not currently known, and may never truly be. Regardless, despite highly favoring Puljujarvi before falling to fourth overall, Oilers GM Chiarelli managed to get the player he desired and did not have to trade up to do so. A fair bit of Draft luck indeed. When it comes to the approaching 2016-17 season, expectations surrounding Puljujarvi will be high, yet also tempered. In years passed, players drafted by the Oilers have been expected to arrive in the NHL and immediately dominate in their rookie season. Yet, with the presence of McDavid, Draisaitl and Nugent-Hopkins, as well as the signing of Lucic, Puljujarvi should feel considerably lesser stress when it comes to providing an immediate offensive output. Yet, with that being said, what should be expected of Puljujarvi in his rookie season? 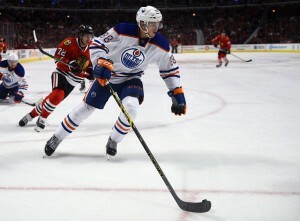 Well, it all depends on his location within the Oilers’ depth chart, however, given the fact that he will surely play with an elite level center-ice man if located within the Oilers top-9, Puljujarvi could quite easily score 20 goals and 40 points as a rookie given his explosive skill set. As a rookie who should challenge for the Calder Trophy, Puljujarvi will certainly be a player to watch for the Oilers this coming season. Undoubtedly the Oilers’ biggest addition this past offseason, Larsson will step into the Edmonton lineup with little to no room for error. Having been acquired in exchange for a fan favorite in Hall, Oilers management as well as the team’s fanbase will be expecting a phenomenal season from the vastly under-rated defender, yet whether or not he will be able to live up to his lofty expectations quite obviously remains to be seen. Having played his entire career in the small hockey market of New Jersey since his fourth overall selection in the 2011 NHL Draft, Larsson has long flown under the radar. However, according to those close to him in New Jersey, the hulking Swede’ is one of the most under-appreciated defenders in the League, whose best play remains ahead of him. Projected to be a top-pairing defender with the Oilers this season, Larsson is a big-bodied and sound defender who prioritizes defense and carries a slight offensive upside. Sure, he scored just three goals and 18 points last season, but he averaged 22:31 of ice time per game against his opponents top forwards while recording an impressive +15 rating. In 2016-17, if Larsson can add to his offensive totals while playing the sound, shutdown style of defense he has throughout his five-year career to date, the Oilers’ blue-line will be dramatically improved. Sure, he isn’t the most popular name in the NHL, but if he can continue to eat major minutes and provide the Oilers with a greater probability of success, he should become a household name over his next five years in Edmonton. Long in desperate need of defensive help, Brandon Davidson stepped into the Oilers lineup in 2015-16 and was nothing other than a pleasant surprise. In all, he skated in 51 games for the Oilers, recording four goals and 11 points. Yet, it was his defending which was the most promising aspect of his game, as he arrived in the NHL and began to shut down opposing forwards with ease on a nightly basis. As the season came to a close, Davidson was averaging roughly 24 minutes of ice time per game, while he even recorded 26:32 of ice time in a game against the powerhouse Anaheim Ducks in late February. Unfortunately, an injury suffered early in March cut Davidson’s rookie campaign short, although it was one which created much hype and promise around the 25-year-old defender. As such, heading into 2016-17, Davidson will be an extremely interesting player to watch, especially so considering a great season from him could mean a great deal in the standings for Edmonton. A major point producer from the back end during his days in the Western Hockey League, Davidson’s offensive prowess has yet to transition to the professional game, although it is on the defensive side of the puck where Davidson earns his paycheck. In 2015-16, Davidson recorded a team-best +7 rating, while his CF% of 52.1% ranked seventh best on the Oilers roster, a clear indication of his defensive abilities and shutdown style. Edmonton signed Davidson to a two-year, $2.85 million contract extension in February of 2016, providing the youngster with another two years for continuing to develop his game at hockey’s highest level. In 2016-17, Davidson will likely begin the season on the second defense pairing playing alongside Andrej Sekera. If Davidson can continue to play sound defense while also chipping in offensively on occasion, the Oilers could boast one of their strongest defensive cores in recent years. A great year for Davidson could be the difference between missing or making the playoffs for the Oilers.